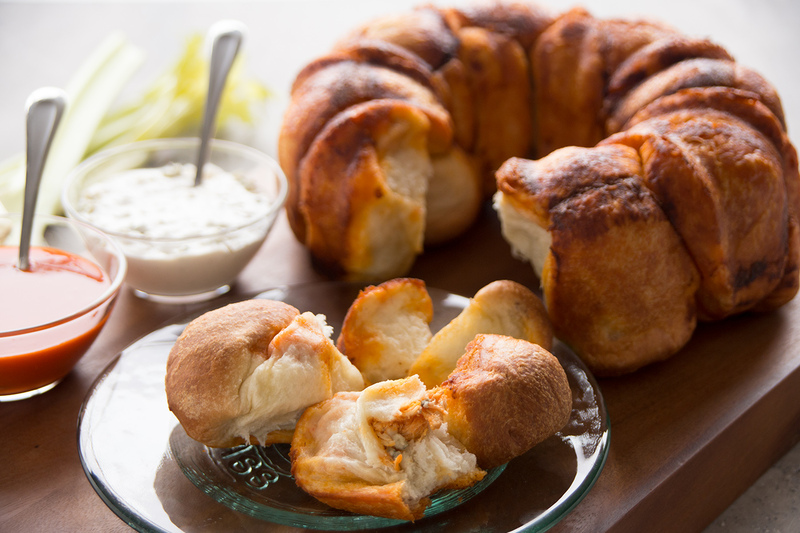 The zippy taste of Buffalo Chicken all baked up in a fun pull-apart bundt. Spray counter lightly with non-stick cooking spray. Cut each roll in half and press each half into a 3-4 inch circle. Combine chicken, 1/2 cup wing sauce and crumbled bleu cheese until mixed well. Divide filling equally between dough circles. Bring edges up and pinch together to encase the filling and make 40 dough bundles. Pour the remaining 1/4 cup of wing sauce in the bottom of a well sprayed bundt pan. Drizzle the bleu cheese dressing over the wing sauce. Dip all the dough bundles in melted butter and layer in the pan. Cover with sprayed plastic wrap and let rise 30 minutes or until dough is about 1-inch below the top of the pan. Remove wrap and bake at 375 degrees F 20 minutes. Cover with foil to prevent over browning and bake another 10-15 minutes. Remove from oven and let sit 5 minutes then remove from pan to serve. Serve with extra bleu cheese dressing, if desired.